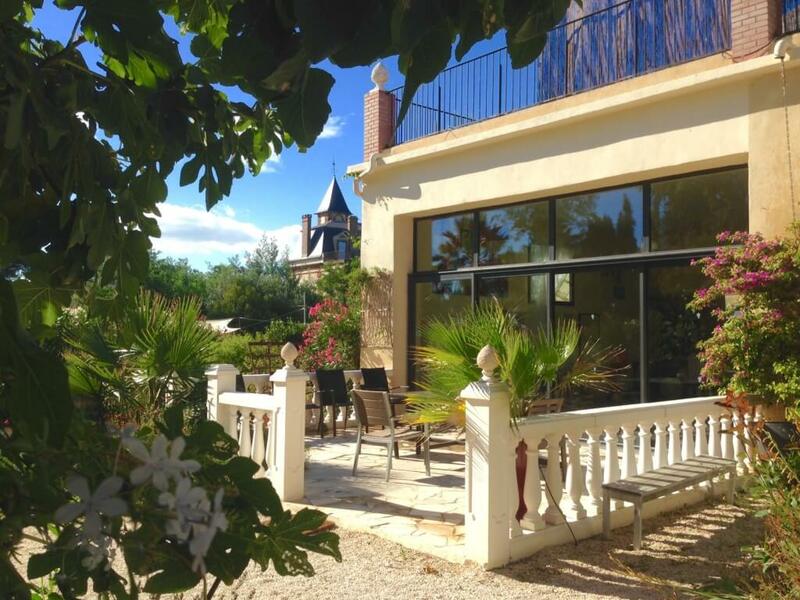 Welcome to the South of France – one of the finest holiday destinations in the world. To narrow down your choice of resort, first of all, make sure you understand the geography of the region. The South of France means different things to different people. For example, the most famous region is the Côte d’Azur (the French Riviera) – St Tropez, Toulon, Nice, Antibes and the like. But when you look more closely at a map, you see that there are many more southern coastal regions that each have their special charms. Marseille in some ways marks the western edge of the Millionaires’ playground and the Provence region that is so beloved of fifty-something Brits dreaming of a better life abraod. But move further west and things become really interesting. 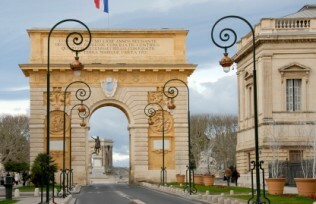 Montpellier – one of the greatest French cities and very much on the up. Known as a university town, but in some ways it feels very much like a mini-Paris and its population is expanding year on year. For many holidaymakers new to the South of France, the vertical coastal section down from Montpellier to the Spanish border is something of a mystery. Is it devoid of life? Has anyone actually ever travelled there? In fact, there is so much to discover down this coastline – let’s take a brief look. Once we name the area as Languedoc Roussillon, it becomes a bit more familiar. We’ve all heard of the wines from this region, and in fact they are becoming better and better each year, shrugging off the old stereotype of “bag in a box” wine that held true for rather too long. 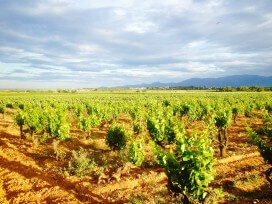 This picture shows a vineyard on the Roussillon plain, in the very far south of France, near the Spanish border. Many people don’t realise that Languedoc and Roussillon are in fact different regions. The area between Montpellier and just north of Perpignan is Languedoc, with Roussillon then taking over and continuing until the dividing line with Spain. In terms of topography, Roussillon wins hands down. The coastal areas of the Languedoc are flat and generally feature-less, although there are some great beaches. 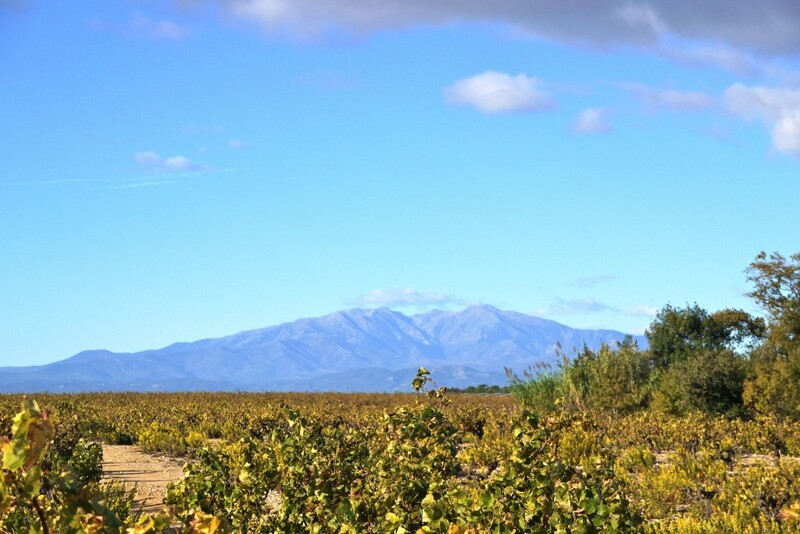 Roussillon looks out to the east onto the Mediterranean sea, which gives the region its warm, sunny climate. To the west are the Pyrenees and to the south the Alberes – in effect the foothills of the Pyrenees. Vineyards stretch as far as the eye can see in many places, offering stunning vistas in which to enjoy the sunshine. So Which Resort to Choose when I Get Here? Well we’re going to be a bit biased here, aren’t we? Imagine Roussillon is one of the premier family friendly holiday resorts in the South of France, operated by parents for parents with children under the age of 10. We offer a very specialised place – a secure and safe environment with high quality apartments and an included package of services. All of this makes Imagine Roussillon a great resort in the South of France. Personal service, a small, exclusive environment and an amazing location. We are just a stone’s throw from the beautiful sandy beaches of Canet en Roussillon and 15 minutes drive from exotic Perpignan. 35 minutes by car will get you across the Spanish border, where your tapas awaits! Now it is indeed true that lots of resorts would claim to be the best, and of course it does depend what makes a holiday special for you individually. What we try to do on our website is to explain in depth what we offer and convince you that our tailor-made child friendly holidays are ideal for you if you are a young family with kids under 10 years of age. Are we the most luxurious? No, a 5 star hotel can certainly out-class us with its chandeliers and finery, but just think of the damages bill when Timmy smashes a priceless vase in the foyer! Do we have the finest location? Yes, we think so. We’re near beaches, mountains, resorts, cities, vineyards and many attractions. You would be hard pushed to find a better coastal location. If you’re looking for a brilliant child-friendly resort in the South of France (near Spain) then please do get in touch – we would love to hear from you!